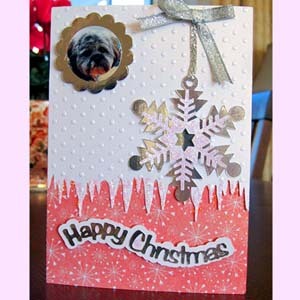 This is a photo sent in by Jean, another of my lovely customers, of a card she's made with the Hanging Snowflake freebie. I love the idea of adding the little photo - this would be ideal for some of my pet loving friends so thank you Jean for the idea. Just thought I would show you this photo sent to me my by my lovely Blogger friend Annie of the card she has made using the Hanging Snowflake freebie. I'm sure you'll agree that her interpretation of the template is fabulous. 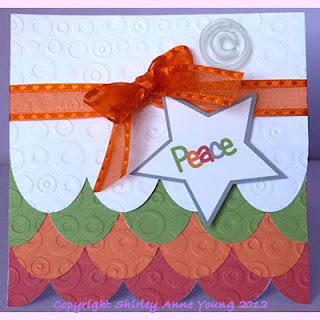 Annie makes really beautiful cards so why don't you check out her blog to see her creations. If you look in the Gallery you'll see more photos sent in by some of wonderful customers. I'd also like to say a big thank those of you who take the time to leave me comments, I really do appreciate it. Here's a freebie Christmas Card & paper for you. Just thread some string or ribbon through the snowflake and fix it to the back of the icicle before sticking on to the base card. Am sharing the backing paper too. Hope you will take time to let me know if you like it. It's been a while since I posted but here are two cards that I finished today. I ran the centre of the bauble through an embossing folder to give some texture and I added some snow to the Skyline card using some SnowWriter sprinkled with glamour dust while it was still wet. It gives a nice 3D effect which doesn't show up too well in the photo. The title says it all really - I'm thinking this will apply to all of us when the after Christmas sales start - what do you think ? Although I cut this on my Cameo a cutting by hand template is also available. 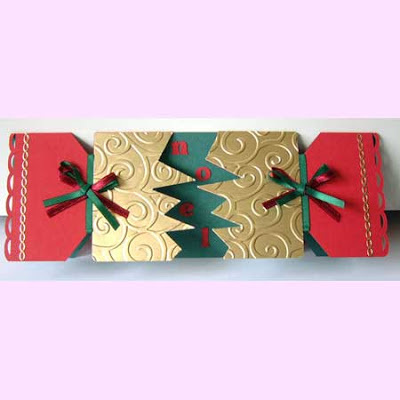 Here's a little freebie to start the week - a Christmas Cracker Card - hope you like it and will leave a comment. A handcut template is available for this card too. 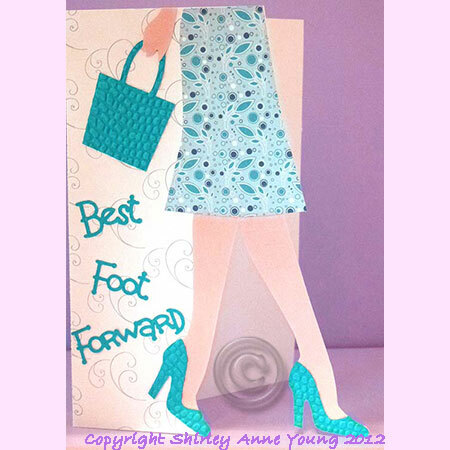 This is a card I've made for the Cameo Spotlight Challenge no 7 which is to use the colours above. Really struggled to come up with something but here's my effort which is a tent style card. 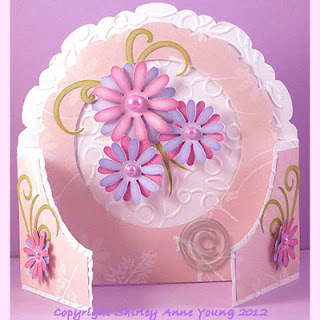 The card and layers were cut on my Cameo and embossed using one of my Cuttlebug folders.